Today's contributors are: Sara, Frank, and Scott. Again, please update your links to www.ceetar.com/6thfloor The blog will be updated there shortly. Likely this is the last post via blogger. 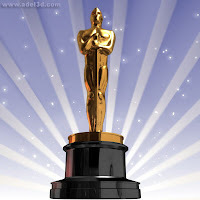 Presenting 6th Floor Blog's Oscar nominees for must-see movies! It seems like this movie only got recognition because Heath Ledger died after doing an excellent job portraying the Joker, but it was really an excellent movie. I'd even venture to say the best Batman movie ever. I agree. It was a great movie; suspense, action, excitement. It borrowed from the comics obviously, but it was an original story, and a compelling one. Spectacular or not, you have to go see a Bond movie. Action, explosion, gadgets, cars. It's hard to make a bad Bond movie, and that means it's always worth seeing. The only thing to debate is if you liked the Bond Girl, or if the movie didn't have enough over the top explosions. This is certainly not a serious movie, and as such would never ever be considered a 'great' movie, but I sure enjoyed watching it. Sometimes complete ridiculousness, like curving bullets, is fun. All the silly stuff they do such as Angelina Jolie (and that's almost enough of a reason to see a movie in it of herself) scooping up the cowering 'hero' with her car., is just zany. Sometimes it's more fun to just say 'screw physics'. That was my entire college philosophy! We may be biased about this one, being in New York, but I felt this was a rather compelling movie, despite all the crazy cult hype. The problem was people looking for a monster movie or comparing it to Godzilla. It wasn't about the monster, it was about the journey of the characters through the city while the monster attacked. The reason they didn't just run for the border was a little bit of a stretch, but after you accept that, it was interesting. I enjoyed the different way it was filmed, as if from the camera the guy carried around the whole movie. Now that was a little contrived. Who would keep carrying the damn thing around at that point? It must've been an awesome camera, but still, good movie. I liked Iron Man. I know some didn't, but it was a good comic book movie, and he had some excellent cars. It was half Iron Man, half Tony Stark. I think it was rather well done for an origin story movie. I'd like to see more. He'll be in the Avengers movie right? When's that come out?